Dog Breeds. Learn all about the different dog breeds. Pictures and information about dog breeds. 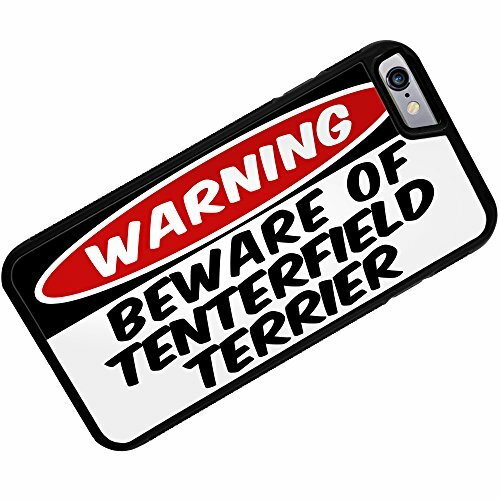 In what country did Tenterfield Terriers originate? The Tenterfield Terrier originated in Australia and was at one stage also called the Miniature Fox Terrier or the Mini Fox Terrier. The full origin of this dog isn’t fully known. One school of thought is that the smallest puppies from Fox Terrier litters were crossed with other small breed dogs. In the late 1800s, the Tenterfield dog was a definite part of rural Australian life. By the 1920s, he was also a popular dog breed for families in the suburbs too. The name – “Tenterfield” is a town in New South Wales, and was incorrectly thought to be the birthplace of this breed. However, the truth is that the town is just one of many places where this dog lived. The town has a different significance to Australians as the owner of its saddlery was the grandfather of the entertainer, Peter Allen. He wrote the “Tenterfield Saddler” about his grandfather who also happened to own quite a few small types of terriers. The dog was named “Tenterfield” in the 1990s by Don Burke, a popular TV personality of the time. The name was accepted as a renaming of a Miniature Fox Terrier. What Does a Tenterfield Terrier Look Like? As for the dog itself, his coat is fine and short and he’s a square, well-balanced dog breed. Most of these dogs are predominately white and have tan, liver or black markings. How Big Do Tenterfield Terriers Grow? He’s usually 25 – 30 cm and the Tenterfield terrier weight is proportional to his height. How Long Do Tenterfield Terriers Live? The life expectancy of this dog is 14-15 years. 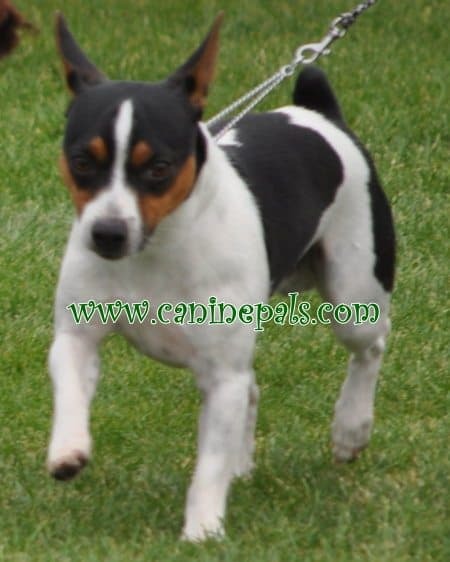 The Tenterfield Terrier is an agile, active, strong, versatile working terrier. He’s confident, bright, happy and keen to learn. He’s very loyal to his owner. He’s independent, clever, fearless, highly intelligent and bold and has an alert facial expression. As a dog breed, this is a typically healthy animal. However, he’s prone to facing patella luxation and hypothyroidism. Tenterfield terrier training is similar to most terrier dogs, you need to be patient when training him. He’ll respond the way you expect if you use methods of positive reinforcement. Hitting and yelling will get you nowhere. The Tenterfield dog is very friendly and loves to curl up in your lap while you’re sitting in your favourite chair. However, he’ll be noisy and may be destructive if he’s bored. He gets along well with children. He can’t be trusted with other pets including guinea pigs and mice. He has a strong terrier “chase and kill” instinct. The Tenterfield Terrier needs to be kept occupied as much as possible. He needs daily walking or jogging. He’s ideal in fly-ball competitions and agility trials. He needs to burn off his energy so he’ll settle down when you want to relax. All small dog breed are inclined to be “yappy” unless trained to behave otherwise. The Tenterfield Terrier is no exception. Grooming is easy for this pet. Brush his short haired, smooth coat regularly with a firm bristle brush. Wash him fortnightly in the warmer periods and monthly in the cooler weather. Use a chamois or towel to rub his coat so it shines. Do Tenterfield Terriers Shed Hair? All smooth coated dog breeds shed coat on a daily basis. This shedding can be controlled by regular grooming to remove dead hairs before they shed. Most Tenterfield terrier breeders will provide grooming instructions on how to handle shedding. A small dog doesn’t need a huge home to live in. He loves families and gets along children of all ages. He has a lot of loving to give and he only asks to be loved in return. The Russian Toy (aka the Russian Toy Terrier), also known as the Russkiy Toys is a small dog breed that was originally bred from the English Toy Terrier (aka the Manchester Terrier). This breed has two types, a long coat and a short smooth coat. 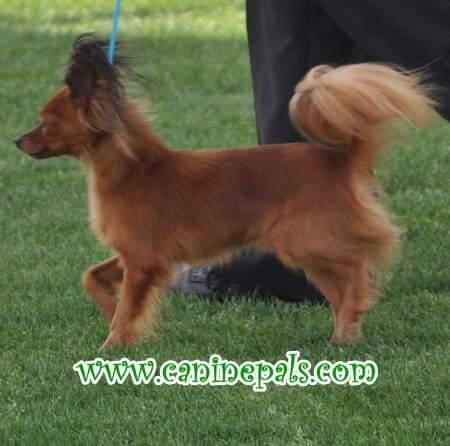 Originally the long coated dog was called the Moscow Long Haired Toy Terrier. The short smooth coat dog was called the Russian Toy Terrier. In 1988, both dogs were combined and became the Russian Toy Terrier. In 2006, the “terrier” word was dropped because this dog was officially listed in Belgium’s International Federation of Kennel Clubs. This breed came close to being wiped out twice. The first time was during the 1920s during the Communism era because he has strong ties to the aristocracy. The second time was because of the influx of foreign breeds once the Iron Curtain fell. The Russian Toy is one of the world’s smallest dog breeds and measures 20-28 cm and weighs 1-3 kgs. Its distinctive small head has triangle ears and large eyes. In the countries that have banned docking, this dog’s tail is curved like a sickle. 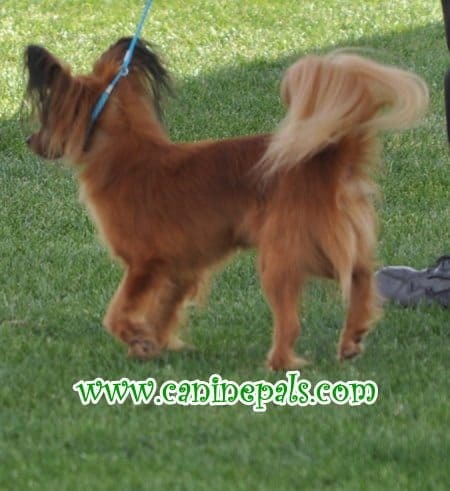 Both varieties of this dog can be crossed so one litter may have long and smooth coated puppies. There have been times when two dogs with smooth coats have been bred and a long coat offspring is born from that unity. This only happens if the long hair gene is part of their pedigrees. However, the reverse hasn’t been known to occur. The Russian Toy has four main colours: solid red of differing shades, brown and tan, blue and tan or black and tan. The red colour includes red sable (red with an overlay of brown) and sable (red but the hair tips are black (overlay). A vet is often needed if “baby/puppy teeth” have to be removed. If this isn’t done (generally under an anaesthetic) both baby and adult teeth will try to occupy the same jaw socket. This can cause gingivitis, tar tar deposits, periodontitis and tooth decay. These problems can lead to teeth being lost prematurely. Russian Toys can easily have fractured bones because they’re so small and somewhat delicate. They can suffer from patella luxation, where the knee cap slides out of place when the knee bends because the groove that’s supposed to hold it firmly in position isn’t deep enough. Patella luxation can be a genetic and/or environmental problem. This small dog has a cheerful, active temperament and can become very attached to his family, regardless of the ages of each family member. He’s very reserved around strangers and demonstrates powerful loyalty to his owners. Originally he was bred as a watch dog and rat dog. The watch dog trait is still quite distinct and, although he’s small, he can be very vocal and protective if danger to his family is perceived. The Russian Toy Terrier is ideal for people living in smaller spaces because of his size and temperament. He’s good-natured and great with families, including young children. However, as with all breeds, do your homework before taking one home to meet the family. The Chinook dog was developed as a sled dog in the United States. His function was sled dog races and drafting. He was bred to mix the speed of lighter sled dogs and the strength of freighting dogs. He’s a very athletic dog with a hard body. He has great rear extension and forward reach in his endless gait. He has an impressive look, black eye markings, dark almond eyes and an aquiline muzzle. His ears sit in various different positions and his coat is a close fitting fawn colour. His saber tail is generally displayed as a graceful sickle curve. The male Chinook is significantly different from the female of the species. The female has a feminine look and needs to be judged on equal footing with the males. This dog should be presented without trimmings and in a natural condition. This breed is a family dog that demonstrates lots of affection and is keen to please. He’s playful, versatile, easy to train and loves children. He loves lots of regular exercise including daily walks and other activities including: hiking, backpacking, jogging and a sport called skijoring (a winter sport where a dog pulls someone behind him who’s on skis. He loves a fenced in yard so he can play when you’re busy. He’s NOT a good guard dog as he has poor protective instincts. His thick double coat is a seasonal shedder so he must have regular washing and brushing to minimise shedding. A Chinook puppy needs to socialise to help boost his confidence. This includes taking him to a puppy class. What and how much and how often you feed your adult dog depends on numerous factors. You’ll need to create the right formula designed to meet his ever-changing, individual digestive needs as he grows older. Numerous dog food manufacturers have created breed-specific formulae for all sizes and breeds. The Chinook usually lives between 11-13 years. You’ll decide what to feed him but you should consult your vet and/or breeder to learn what and how much to feed you’re your dog, as a puppy and as an adult. He should have access to plenty of fresh, clean, drinking water whenever he needs it. This breed’s double thick coat will shed hair according to the seasons so regular brushing and bathing can minimise this. Use a decent slicker brush during the season for shedding. Nails should be regularly trimmed by using either a grinder or nail clipper to help avoid cracking, splitting and overgrowing. Ears must get a regular check-up so debris and wax stands zero chance of building up and possibly causing infections. Chinook teeth must be regularly brushed to keep them clean. As with all dog breeds, a Chinook may have health problems such as: eye disease, hip dysplasia or patellar subluxation. Having said that, the good news is that most Chinooks are very healthy. Colour: The Chinook has a general tawny colour but it ranges from a deep reddish-gold colour through to a pale honey shade. This is a Chinook’s distinguishing characteristic. A diluted tawny colour and the dilated pigments around the eye rims, on the pads of his feet and on his lips and nose. While this is acceptable, it’s certainly not ideal. It’s highly desirable that the muzzle and ear colouring is a darker shade than that of the dog’s body. It runs from a darker tawny to a shade of black; some black shading is very much preferred. In the inner corner of both eyes, it’s highly desirable that there’s a black apostrophe- shaped mark. It’s acceptable for there to be symmetrical pale to gold or white markings on the cheeks, underside, breeches, chest and throat. Any other white marks aren’t acceptable. This includes: scarves, socks and blazes. The Chinook must be a tawny colour, as other colours are a disqualification. Females= 22-24 inches. Males= 24-26 inches.